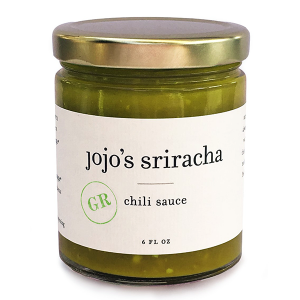 Jojo’s Sriracha is a tiny company, often a crew of two or three, but has had the good fortune to create something truly noteworthy with big reach. 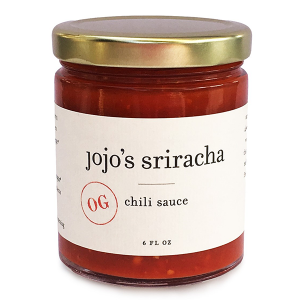 Jojo’s Sriracha has been featured in ‘Sriracha,’ the documentary, and on The Cooking Channel. Jojo has been filmed by Liza de Guia, a James Beard award-winning food documentarian and had the privilege of collaborating with Joel Peterson, founding winemaker of Ravenswood Winery, on their wine-infused sriracha. Since moving their production from shared kitchens in Brooklyn to their own 323 sq. ft. commercial kitchen in Denver, they have worked closely with farms in both Colorado and New Mexico to create a unique green chili sriracha that is indicative of the region. Did we mention it’s awesome?